As a matter of fact, my son, Kraig, went a bit wild about this dressing and salad. See, he’s been making sporadic attempts at taking really great care of himself and coming to me lately with his ideas. I, of course, want to take full credit for anything good in his life and am marking it down to early lessons. Anything that happens that’s not so great, well, I have the other Mom card to play! Seriously, ya gotta love kids for all the joy and new perspective they bring into your life, and that I’m sure happens at any age! And while sometimes I think we’ve had more than our share of issues over the years, I never stop thinking how blessed I’ve been with my children who are a constant source of love and strength (although they could call more!) and never stop surprising me! You would not believe the work Kraig and his g/f Tweety have been doing out in my yard this spring, before the 15 inches of snow we got the last two days! But speaking of surprising, this dressing on this Kale Salad IS surprising. And I didn’t know what else to call that dressing…Creamy Mayonnaise Dressing with a little Asian Flair? But it doesn’t read as Asain at all, even though it has some Miso paste and a touch of sesame. Both just add beautiful depth to the dressing. And then it has capers to stand in for the anchovies, and they’re just great in this, cutting through the richness of the mayo. Use a Vegan mayo if you lean that way. But maybe the real reason I call the dressing “Caesar” is because I saw Damaris Phillips make something like it on Food Network and was primed to think of it as a Caesar dressing because that’s her name for it. I was psyched when I saw her make it, but I changed it up a bit to fit my taste (less garlic, no mustard a lot less sesame oil) and now it’s a new family favorite. This is such a super easy, mix together dressing with just a handful of ingredients that you’d never guess how good it tastes – and I’m not even usually a creamy dressing gal, and I don’t know if I’ve ever used Mayo in a dressing, before. I guess I’d have to scan through my Salad Dressing menu! You can probably sub in Greek yogurt with no issues at all. I also love fresh garlic in my dressings, but in this case, I knew the dressing was going to be more than I could use with one salad (the dressing keeps well for about four to five days, tightly covered) and I didn’t want the garlic becoming stronger and stronger. So I just used a little garlic powder. You can do the same with garlic salt, just go by taste when you add salt into the recipe. Other than that, mix the dressing together, riff on it, look at the original recipe if you want to and I hope you love this as much as we did! 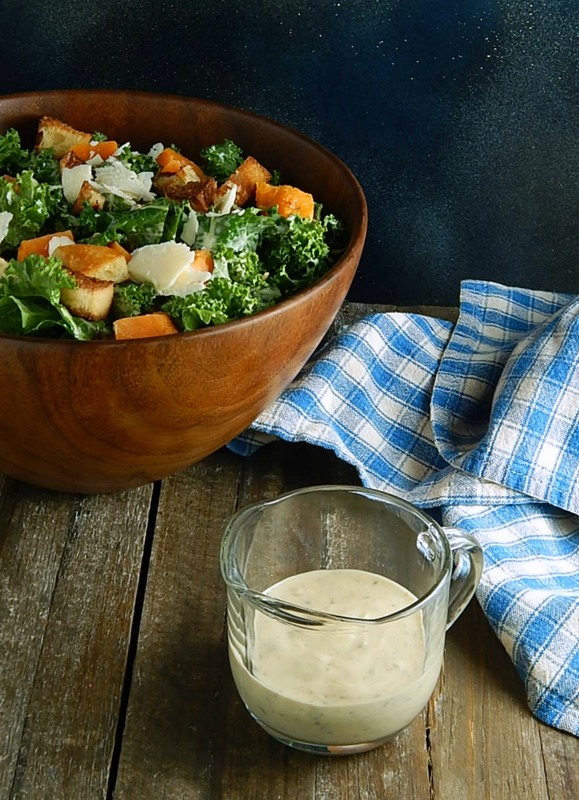 I thought it was the perfect counterpoint to the Kale salad and as it sat for a while, all the flavors melded together, the kale softened a bit (without any fussy “massaging”) and the sweet potatoes I used in the salad absorbed some of that dressing! Mmmm! I talk a lot on my blog about saving on this ingredient or that (stock up on condiments for the year during the summer sales, check for honey at your pharmacy when they run their great coupon specials) but I haven’t talked a lot about Miso. Miso is a fermented paste and you can find it at the cheapest along with other Asian ingredients if you’re lucky to enough to hit a sale prior to the Lunar New Year. That day changes every year, and in my area, at least, there are often unadvertised specials. You’ll probably find it for less at an Asian market, along with the sesame oil. Miso, since it’s fermented keeps a good long time in the fridge. Months and months. I store it upside down which keeps it fresher; any paste around the top of the bottle doesn’t dry out. I do have a few other recipes with miso on my site if you’re looking for ways to use yours up; just follow the tag for “miso paste” at the bottom of the page. Smash the capers along with the salt using the side of a knife until mashed and broken, then grind into a paste. In a small bowl add the mayonnaise, garlic powder, sesame oil, miso paste and honey, and stir. Add in salt and pepper to taste. Note: To roast or bake sweet potatoes, preheat oven to 400 degrees. Pierce sweet potato in several areas with the tines of a fork or a sharp knife. Bake for about 45 minutes or until it gives easily when pressed. Remove from oven and open immediately so it doesn’t continue to steam. This entry was posted in Click here for Bargain Meals, Click here for Fabulous Food Posts and tagged Bread, capers, Cheese, Croutons, Honey, Kale, Mayonnaise, miso paste, Nuts and Seeds, parmesan, pine nuts, Salad, Salad Dressings, Sweet potato. Bookmark the permalink. I use kale in my salads a lot but rarely make on based on kale. This sounds delicious and the dressing sounds spectacular. I think I can ketofy the dressing and the salad for something different for tonight! Thanks! Hi Anne – I tend to do that with kale, too, cut if very finely and mix but I do love the way the dressing takes the kale on! That dressing is something else! I hope you loved it!